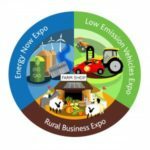 The Energy and Rural Business Show, taking place on 6 and 7 February at Telford International Centre, is an event for farmers and landowners who want to look at options for renewable energy and low emissions vehicles. It includes three exhibitions in one space, including the Energy Now Expo, and explores the latest policy advice and diversification options for sustainable land use and rural livelihoods. If you’d like to learn more about renewable energy and how CAT can help, come and talk to us at stand 54. Dr Alan Owen, CAT renewable energy consultant and lecturer in our Graduate School of the Environment, will be on hand to offer advice and answer your questions. Speaking at the event is Dirk Hendricks from the European Renewable Energy Federation, who will present on the likely impact of Brexit on the renewables sector. CAT graduate Sonya Bedford, who recently completed her studies in MSc Sustainability in Energy Provision and Demand Management, will be speaking on ‘Generating renewable energy without subsidy’. Andy Eastlake, from the Low Carbon Vehicle Partnership will outline their plans for ‘Driving low emissions in the rural transport sector – the policy dimension’. Practical guidance on the future of the new Environmental Land Management (ELM) scheme will be outlined by Marie Hall, from Defra, who will present on ‘Environmental Land Management – a look at the government’s 25-year plan and the opportunities available’. Energy Now Expo: Celebrating its 10th year, the Energy Now Expo will feature an exhibition, an energy storage theatre, a one-to-one advice clinic and a multi-streamed conference. NEW Rural Business Expo: This new addition to the show will have a raft of industry experts offering practical advice in dedicated “how to” workshops. NEW Low Emission Vehicles Expo: Includes on-stand presentations and examples of low impact vehicles and farm machinery. The event is free to attend and places can be booked today: http://www.energyandruralbusiness.co.uk/visit/register-to-visit.